Varsity fencing continues to grow in popularity, as evidenced by this year's roster of 38: a mix of talented returning fencers and enthusiastic newcomers. Among the upper classmen on this seasos's team, five fencers were named to the Skyland Team All-Conference: seniors Jada Davis, Luke Fischer and Samuel Zimmer and juniors Mary Frances Howard and Rachel Richardson. In addition, several underclassmen distinguished themselves at the Frosh/Soph Montclair Invitational. 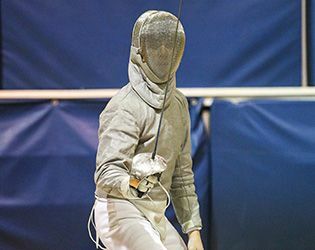 Freshman Brianna Moglianesi brought home the gold medal for women's epee, freshman Alex DeRing took fifth in men's sabre and sophomore Nick Bhimani took sixth in men's epee. In mid-January, the girls competed in the Santelli tournament, where they placed 35th overall, and the boys in the Cetrulo tournament, where they placed 30th overall. At month's end, the team fared well against some tough regional competition in the NJSIAA district tournament. The boys' squad finished in ninth place and the girls in eleventh. In February, after a strong showing at the Montclair Frosh / Soph invitational, the team ended the season with the Prep B Championships at the Ranney School. After a somewhat rough start, the fencers pushed through to amazing results. On the girls' side, the epee squad took third place, the foilists garnered fourth, and saber finished in eighth. For the boys' team, the foil squad claimed fourth place and saber, eighth. Among the fencers, Fisher and Nichole Morley '17 advanced to the individual round. Fischer took third in the individual competitions, a feat he has repeated three years in a row, and Morley, making her first-ever appearance in the individual rounds, placed eighth. Looking ahead to next season, the team will miss the contributions of 13 seniors from this year's roster: Colette Bilynsky, Emma Corbett, Samantha DeRing, Davis, Fischer, Katherine Huang, Bruce Li, Jacqueline Luberto, Ross Pollack, Zoe Quan-Shau, Alexandra Udoff, Zimmer and Mycroft Zimmerman. The program will look to this year's juniors to lead the way next winter: Landon Braemer, Howard, Morley, Justine Murray, Patrick Reilly, Richardson, Jack Riccardo, Lauren Seng, Luke Solondz and Lachlan Wright. This year's small core of sophomores, Jessica Abowitz, Danae Aslidis, Bhimani, Harsabreen Chadha and Cynthia Hu, will be expected to take on larger roles next winter, as will the team's capable freshman fencers: Edith Brazil, Genevieve Caron, Vivian Chang, Alex DeRing, Emma Koslow, Jenna Meyer, Brianna Moglianesi, Barrett Reep, Mark Rusas and Iyanah Vemuri. Reflecting on this season's highlights, head coach Elyse Gurnowski said, "These are stepping stones for the Gill program, which has only continued to grow in size and talent. I cannot wait to see what the team accomplishes next season."